Experience weighted attraction (EWA) combines reinforcement learning with fictious play models and has proven to perform well as an explanatory model in economic experiments on individual decision making. Yet, EWA is a relatively complex model with a rather large number of free parameters and includes characteristics of simpler decision models, which might explain its good performance on laboratory data in the past. We present a simulation study which uses different models (including EWA) to generate order decisions in a newsvendor setting. Next, maximum likelihood estimations of these models are executed on the generated data and the fit of the models is evaluated using information criteria. Attention is focused on the performance of EWA. Furthermore, we present analyses on the parameter mix of EWA if more parsimonious models or a mix of these simpler models are used. Our results indicate that decision makers in newsvendor problems do not follow unique and simple decision rules. The results indicate that (1) the maximum likelihood procedure combined with the use of information criteria generally is suited to identify the true model; (2) EWA does not perform well when static models are given; yet, (3) in a mix of static and dynamic models EWA once again performs best. 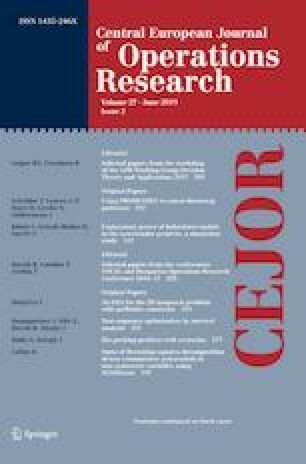 Given the past success of EWA on experimental data on both aggregate and individual level, these results may indicate that decision makers in newsvendor problems do not follow unique and simple decision rules.